One of the best-known manufacturers of computer graphics cards NVIDIA now, shows-off the world's first AI computer that has been designed to power fully-autonomous 'robotaxis'. The company claims that Pegasus, marks the first time that the Drive PX platform of Nvidia has been capable of driving Level 5 driverless cars, that means vehicles that now require no control by a human, have full automation and don't require pedals, steering wheels, mirrors or controls will soon come into existence. Pegasus is comprised of four AI processors that include two of Nvidia's latest generation Xavier models with embedded Nvidia Volta GPUs and two next-generation discrete GPUs that are designed specifically to accelerate Deep learning and computer vision. 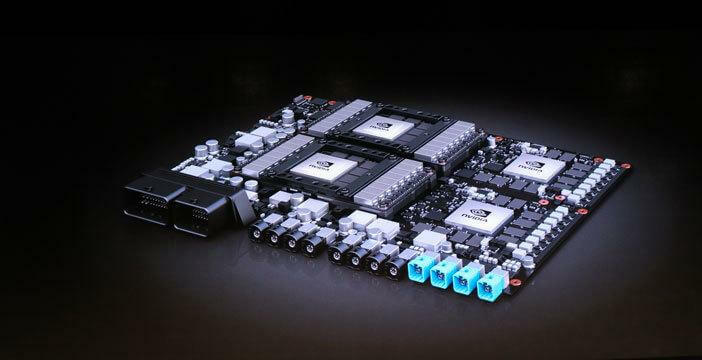 This very new utterance of the GPU maker’s Drive PX platform is said to deliver over 320 trillion operations per second, amounting to more than 10 times its predecessor’s (Drive PX2) processing power and has the same level of power that is generated from 400 CPU's. It surely does realize that a fully autonomous vehicle requires loads of computational power. And Pegasus definitely is up for this challenge as well. Pegasus will soon be marketed to many tech companies and automakers that are currently on developing self-driving cars and is supposed to start in the second half of 2018. To further add to its Pegasus Drive PX platform, Nvidia also presents to us its Drive IX SDK, which is said to be able to see inside and outside of the vehicles hence, allowing the developers to create even more futuristic features for self-driving cars. Nvidia believes that this very new system codenamed as Pegasus will result in the creation of a new class of robot taxis(robotaxis), that will safely transport the passengers to their destination. The overall size of the system is roughly as small as that of a license plate. The main idea playing a role behind this being- The journeys will now be a lot safer due to the fact that, unlike us humans who tend to get tired over time, these self-driving vehicles never get fatigued, impaired or distracted, and also help in the reduction of congestion and will eventually free up valuable land currently used for car parking. They are also said to provide car sharing services. Now, to break the image that we have created in our minds, it is also said that new types of cars resembling offices, living rooms or hotel rooms will be invented on wheels, and the travelers are just simply supposed to order the type of vehicle they want, on the basis of their destination and activities that are planned along the way. In the Present scenario, where self-driving cars are only theoretical, this is a vision that is created for the future, where the vehicles will be capable of handling tasks in all possible conditions. Where the cars AI will take care of you. But it will take a few years, if not decades before our roads and lives catch up to cars that can roam freely without any limitations. As scary and exciting as it seems, The future of our society is going to be reshaped very soon.